Twelve Missouri Southern students participated in Green Dot Bystander training on Thursday, April 20. Green Dot is a program that empowers individuals to use words and actions to promote safety and communicate utter intolerance for personal violence, specifically sexual assault, dating/domestic violence and stalking. The training is a four-hour class that teaches students to recognize situations of power-based violence, strategies on how to report or handle those situations and ways to change culture on campus that violence isn’t acceptable. 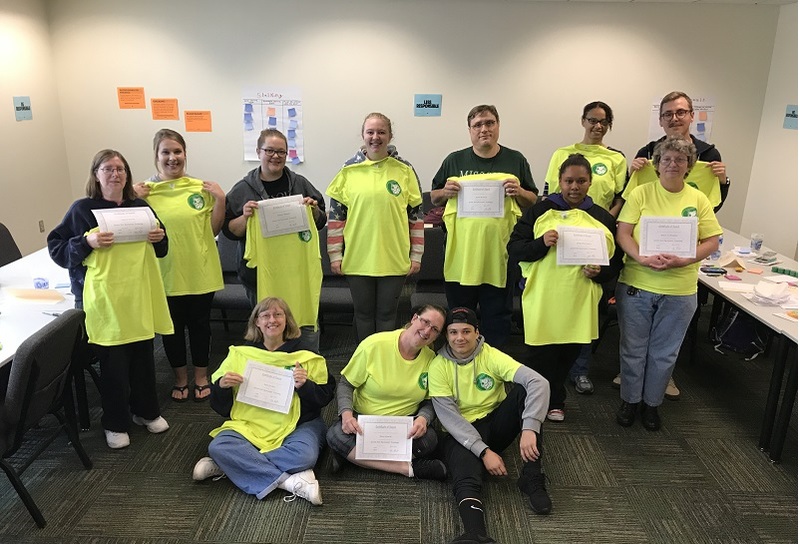 Each student that completed training received a certificate and MSSU Green Dot T-shirt. The university has trained Green Dot instructors available to speak to campus groups, organization or departments. They offer a one-hour overview or the bystander trainings. Contact an instructor for more information. For more information on Green Dot, visit https://www.livethegreendot.com/.